Analysts expect a U.S. light-vehicle sales pace in June of between 15.5 million and 15.7 million, the high end of which would mark the strongest rate since December 2007. DETROIT (Reuters) -- U.S. car dealers like Don Kerstetter have every reason to be happy these days as the industry is partying like it's 2007 -- facing demand not seen since before a recession that drove General Motors and Chrysler into bankruptcy. The owner of Classic Chevrolet Sugar Land outside Houston is on pace for another month of new-car sales above 200, driven by demand for the full-sized pickup trucks that Texans love. "The month has been good," he boasted. "It's picked up over the last week or so in particular. Credit's generally good in our area." Kerstetter is not alone as U.S. auto industry sales in June are expected to rise as much as 8 percent and reach their strongest monthly pace since before the recession that forced the two U.S. automakers to seek bankruptcy protection in 2009. 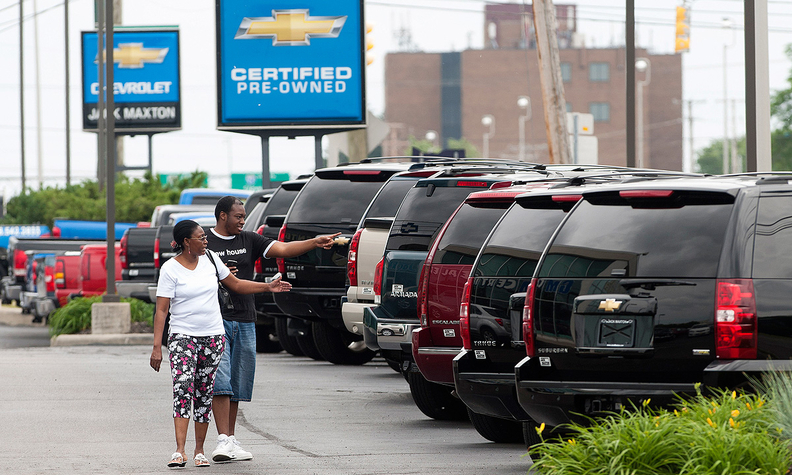 In May, U.S. auto sales rose more than expected as construction workers and oil drillers bought more pickups to meet growing demand for their services, a trend major automakers expect to continue through the rest of the year. Most analysts expect a sales pace in June of between 15.5 million and 15.7 million, the high end of which would mark the strongest number since December 2007. The industry is scheduled to report June sales on Tuesday, supplying an early indicator of the U.S. economy's health. The U.S. housing boom and stable gas prices are playing to U.S. automakers' traditional strengths in pickup trucks and SUVs. So far this year, the growth rate for sales of large trucks, at 21 percent, is three times faster than the industry's. Pickups are among the most profitable vehicles marketed by Detroit's automakers, though current incentives of $5,000 or more can erode the gains. "It's actually quite exciting when you think about where sales could go in a few years if the housing cycle continues to grind higher, improving employment levels," Jefferies analyst Peter Nesvold said. Easing credit conditions and low interest rates are also encouraging consumers to buy new cars and light trucks. Automakers also are benefiting from lower costs, allowing them to book profits on all their vehicles including small cars. Raw material prices, including for steel, have moved lower as vehicle prices have risen. Sterne Agee's raw material cost index is at its lowest level since the end of 2010. Raw materials account for about a quarter of the total cost to produce a vehicle; price declines reduced the cost per vehicle by about $150 last year and even more so far this year, Sterne Agee analyst Michael Ward said in a research note. Meanwhile, incentives are falling, further helping automakers' profits. Industry research firm TrueCar.com estimated they fell another 0.6 percent to $2,537 per vehicle in June to their lowest level for that month since 2002, excluding 2011 when results were skewed by the Japanese tsunami and earthquake. Concerns remain, however, as executives are watching the Federal Reserve closely to see if its decisions could put a damper on consumer demand. "It will be interesting to watch where consumer confidence goes as the market kind of fluctuated in the last week. They talk around eventually higher interest rates and what that means for consumers' buying confidence," Joe Hinrichs, Ford's head of North and South America, told reporters Thursday at the company's product development center in Dearborn, Mich.
Fed Chairman Ben Bernanke last week surprised markets by saying the central bank expected to reduce the $85 billion monthly pace of bond buying later this year and to end quantitative easing altogether by mid-2014 if the economy improves as expected. Several recent economic indicators have painted a picture of an improving U.S. economy, including gains in business spending, and home prices and sales. Consumer confidence this month hit its highest level in more than five years. Duane R. Paddock, chief executive of Paddock Chevrolet near Buffalo, New York, certainly has seen the upside. He was hoping to sell 310 vehicles in June, but the store on Friday already had hit 360 and is aiming to top 400. Last year, it sold 140 cars and trucks in June. "Extremely brisk is the best way to put it, right from the start of the month, and it's carried and gained momentum through the final days here," he said. "We're actually tracking at a 50-percent increase year-over-year."